Kathleen started her business Luscious Landscapes in response to concern for the future of our natural environment and the sustainability of human life. She offers a different approach to garden and landscape design by using techniques and practices that stem from permaculture design models. Permaculture is a world-wide movement of designers, teachers, & grassroots activists working to restore damaged ecosystems & human communities. It is inspired by practical techniques and principles from the study of natural systems which can be applied to our own backyards for growing food and people. Its aim is to create systems that will sustain the present as well as future generations. Kathleen’s connection with the South Coast of NSW goes back some 40 years or more. She has always had a garden, but it was a course with Brogo master John Champagne in 2004 where the permaculture die was cast and set. Kathleen continued her studies in permaculture practices over the next few years and is now a qualified permaculture teacher. 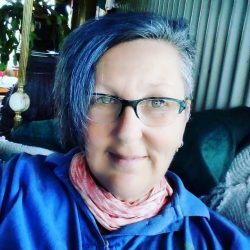 She regularly delivers workshops and training courses on all things permaculture and garden throughout south east NSW.